Holland & Holland Royal shotgun: We always strive for objectivity in our gun tests but occasionally a gun comes along that panders to our prejudices. The Holland & Holland (H&H) Royal 12-bore tested this month is such a gun. I have always thought the H&H Royal to be the ultimate side-by-side. The action was not novel when it was introduced in its cosmetically improved form circa 1892, but it combined all the best features that had been developed by English Gun makers of the golden age. The Royal has since gained a reputation for mechanical perfection and elegance that is matched only by the equally famous Purdey sidelock. Royals are made today in much the same way as they have always been, predominantly on the bench. Computer-controlled machining is used for shaping out some parts initially, but there is still plenty of traditional file- and smoke-lamp craftsmanship (not least in the way the barrels are put together and regulated). The gun is a bespoke product usually made to the customer?s exact specification. The test gun, however, had been made for stock by H&H, as happens occasionally, so the firm can offer a gun with reduced delivery time for those requiring one quickly. Barrels are 28in long, fixed choke and fitted with a concave rib. 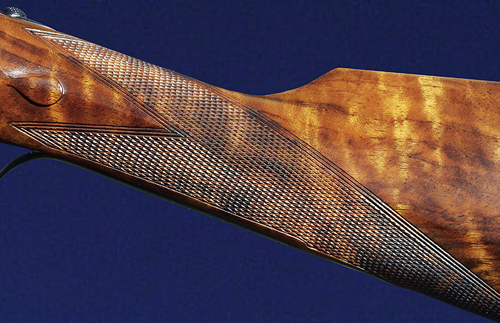 The stock, made from Turkish walnut, has a straight-hand grip of H&H?s diamond pattern (notable for a subtle central ridge running laterally down both sides). The fore-end is of the splinter type and deep enough to be useful. Chequering is well cut. The stock finish is hand-rubbed oil. The bar action ? familiar because so many have copied it ? is equipped with double triggers (mechanical and inertia single triggers are options). The locks, which have intercepting safety sears, are quick-detachable. The action body and lock plates are colour-case hardened and engraved with a traditional H&H scroll pattern ? more open than the fine rose and scroll of a Purdey. There are gold-line cocking indicators and a button-style thumbpiece on the automatic safety. Other features of the action include, strikers which may be removed easily by a small retaining screw visible when the locks are removed, and, in common with most good quality side-by-sides, a replaceable hinge-pin. The chopper lump barrels are exceptionally well presented. The striking up and blacking externally are of the highest order. Internally they are impeccably finished and ? most notably ? perfectly straight. H&H is one of the few firms left still to be really obsessive in this area. It regulates all its guns for point of impact most carefully. Side-by-side barrels tend to shoot apart: if the tubes were merely parallel, the right barrel would shoot to the right and the left to the left. So, during manufacture, the tubes are brought together slightly (usually, in a 12-bore, by means of slight flats at the muzzles). Expert adjustment is required by a barrel maker to ensure that any set of tubes shoots as it should. Classically, this is a process involving trial at the pattern plates. H&H may be the only firm left that employs a full-time regulator at its shooting ground, Steve Cranston, whose job is to make sure all its guns shoot straight. The action of the Royal was introduced in its modern form in 1892 but the Royal trademark goes back to 1885 with the first illustration of the new hammerless Royal gun in The Field the same year (my thanks to Donald Dallas for confirming this), and first mention a couple of years earlier. Initially, guns had non-rebounding locks and dipped locks, but these were replaced with conventional lock plates to give the gun its classic, streamlined look. The action of the test gun is a full, eightpin sidelock powered by leaf springs. The gun is an assisted opener. It employs a coil spring and plunger in a tube hidden under the fore-end between the barrels. It is neat and reliable. Much the same may be said of the Royal?s Southgate-system ejector work, which is a favourite of the gun trade because of its reliability and ease of regulation. The Royal, which weighed about 6lb 10oz, was a really lovely gun to shoot. I don?t know what it is about Royals ? it may have something to do with the hinge-pin balance and the care taken in regulating the barrels ? but I always seem to shoot them well. I used it with Chris Bird and Roland Wild of H&H?s shooting ground (great shots and expert instructors). Trigger pulls were crisp and clean. With shelf dimensions, it not only shot where I was looking but both barrels shot to exactly the same place. It was impressive in all departments. It remains my favourite side-by-side gun and it is a testament to H&H that the firm is still making Royals that shoot every bit as well as any ever made. This is a gun for someone who appreciates that there is more to a great gun than the figure of its wood or the bling of its engraving. A great gun must be faultlessly engineered, shoot superbly and have elegance of form. This one qualifies on all counts. I would buy one if I could.